"Thugs And The Women Who Love "Em," a hip hop musical inspired by New York Times bestselling author Wahida Clark's 2005 book "Thugs and The Women Who Love Them," is scheduled to tour nationally this Fall. The stage production will boast an all-star cast of R&B and hip hop music's notable names including Ray J, K. Michelle, Sevyn Streeter, Jamal Woolard, Boosie Badazz, Lyfe Jennings and Karlie Redd and will debut in Oakland, California on October 3rd. "Thugs and The Women Who Love 'Em" is produced by veteran theater producer Melvin Childs of Produced By Faith and directed by Zadia Ife. The music featured in the stage play will be existing songs from each artist. "I'm truly excited about the opportunity to bring something I think is new and innovative to black theatre across the country," said Melvin Childs. "I think it's time the hip hop/R&B community of today had a chance to tell their stories as they see it to a supportive audience." "Thugs and the Women Who Love 'Em" features four different perspectives from four extraordinary women who've built a sisterhood through some very difficult times. Now, one by one, each of them will be asked to choose between the men they love and the life they want. Are they really four strong, independent, black women ready to write their own story and be the stars of their own lives? Or are they destined forever to be nothing more than co-stars in somebody else's script…nothing more than Thugs and the Women Who Love Them. 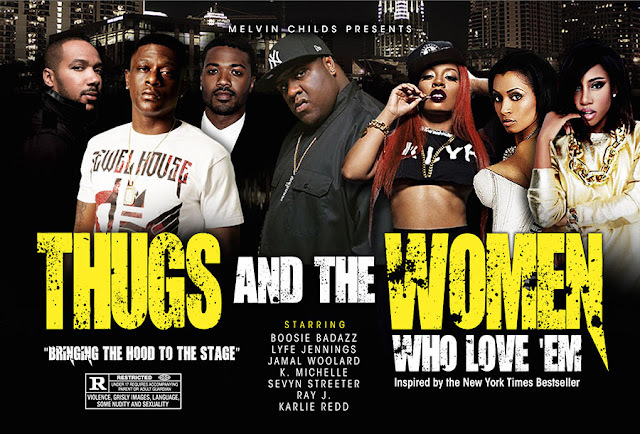 Join the conversation and stay informed about "Thugs and the Women Who Love 'Em" on social media using the hashtag #ThugLove and by following the musical on Twitter, and Instagram @InLuvWithAThug and Facebook at Melvin Childs Presents Facebook.